Broadway Theater characters were brought to life through the iconic animated portraits drawn by Al Hirschfeld. The celebrated African American painter, offers a unique entry point on American history. The images depict both a harsh and joyful experience in a segregated nation. 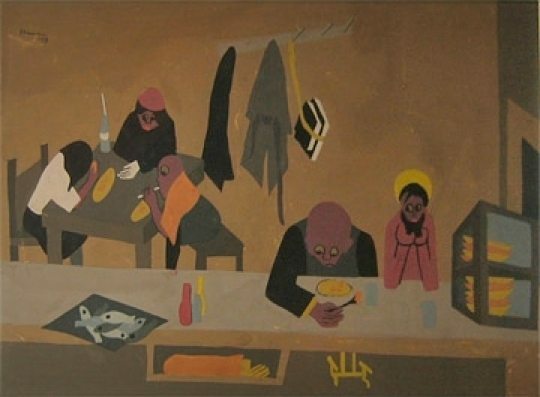 Elie Hirschfeld‘s “Harlem Diner” is one glowing example of Jacob Lawrence’s definitive depictions of the African American experience. The iconic artist Thomas Hart Benton is currently on exhibit at the Metropolitan Museum of Art on the Upper East Side. His piece, “Washington Square Art Fair,” offers a happy and idyllic glimpse at this Greenwich Village setting from a bygone era. The piece hangs in the home of renowned New York developer Elie Hirschfeld who is a noted art collector and feels a particular connection to this painting. Continue reading. His breakthrough work in creating geometric and abstract paintings with no pictorial illusions has been hailed as innovative and inspired. Frank Stella’s Gray Scramble X which was purchased by New York’s eminentHirschfeldfamily in 1973. Lower Manhattan, 1932, Oil on canvas, by Louis Lozowick (1892-1973) is a vision of the New York City Harbor in the early part of the last century. The art exhibit is scheduled to open at the Hudson River Museum in Yonkers this fall and travel to The Norton Museum in Palm Beach next winter.” The exhibit will include work by Georgia O’Keeffe, John Marin, Reginald Marsh, Robert Henri, William Glackens, and George Luks from the collections of The Art Institute of Chicago, the Metropolitan Museum of Art, The Newark Museum of Art and The Rochester Museum of Fine Arts and The High Museum among others. Continue reading.